Asad Allah Isfahani, by general consent of Eastern and Western opinion, the finest of all Persian swordsmiths, and without any doubt the most famous of them all, is unquestionably also the most elusively mysterious. To the best of my knowledge, no contemporary chronicle mentions him as a living being, no details of historical value are known about his life or his work…. Even a cursory review of the importance of the sword in Islam reveals a marked preference which can hardly be overstated. From the advent of the Prophet until the end of the last century, the sword held a position of dual importance, both as the weapon par excellence of the ghazi, and the preeminent spiritual symbol in the realm of futuwwa or knightly virtues. Though repeating firearms ultimately superseded the sword’s importance on the battlefield, it has retained its symbolic emphasis to the present. Consistent with pre-Islamic traditions in the Near East and Central Asia, the sword was an item of considerable veneration in the time of the Prophet, who is reputed to have placed particular importance on weapons captured in battle. Particular swords have long been associated with him, together with other items of military equipment. The Arab tradition of naming swords also precedes the advent of Islam. Such names often referred to an important battle or place of manufacture, though more descriptive and poetic names were quite popular; these imbued weapons with a decidedly animistic character. A particularly well-documented example is the Prophet’s weapon Samsama (Sharp One). The most famous, however, was a sword used by Muhammad at the Battle of Badr in 624. This sword, called Dhu’l Faqar (Possessor of Spines), was later given to his son in law, Ali ibn al-Talib. It holds an especially prominent position in Islamic, and particularly Shi’ite, military and spiritual traditions, as does ‘Ali. Due in great part to diverse interpretations of it lore and name, Dhu’l Faqar was conventionalized into several unusual iconographic representations, the only unifying characteristic among which is an oddly bifurcated tip. The proverb, La fata illa ‘Ali, wa la sayfa illa Dhu’l Faqar (There is no hero like ‘Ali, and no sword like Dhu’l Faqar), is found on swords and daggers throughout the Dar al-Islam. Interestingly, the names of Arab tribal chiefs are recorded together with those of their swords in some period chronicles, indicating the esteem in which swords were held, both as temporal and spiritual weapons during that era. Several swords inscribed with the names of the early caliphs are still preserved in the Reliquary at Topkapi Palace, Istanbul. These swords juxtapose simple, early, fighting blades and lavish, mid-sixteenth century Ottoman mounts, some of solid gold, which serve to reinforce their value as holy relics. Civil and political circumstances in Persia in the latter-sixteenth century were the greatest causes of expanded trade and the export of luxury consumer goods to Europe and Central Asia. Primary among these were carpets, textiles and finely embellished weapons. In 1588, Abbas I acceded to the Peacock Throne, at the lowest ebb of the Safavid dynasty. It fell to him to reassert the power of the monarchy, as well as to reestablish and maintain Persia’s borders. He was seventeen, and promptly learned the consequences of kingship— Persia was threatened in the east by the nomadic Uzbeks and the Mughals, and to the west by the Ottoman Empire. Unable to fight on both fronts simultaneously, Abbas had little choice but to settle a hasty peace with the most powerful of his opponents; he was compelled to cede large portions of Western Persia, including Azarbaijan, to Sultan Mehmet III in 1589/90. This allowed Abbas a respite of several years, during which time he undertook to dissolve existing Persian tribal alliances and construct an entirely new state military. Under the former feudal system, soldiers were compensated either by a small percentage of acquired loot or paid by the petty tribal leaders for whom they fought. The Shah’s new army or Ghulam (slaves) were the descendents of Georgian, Circassian and Armenian immigrants. Converted to Islam, trained and maintained on a regular salary by the shah, the ghulam army represented a novel development among sixteenth-century Islamic states. Abbas’ reign was marked by an arduous, though effective, transformation of Persia, both political and economic. Period paintings invariably portray intelligence and discernment in his features; even the painter of the Mughal propaganda piece Jahangir’s Dream succeeded in conveying, despite Abbas’ supplicating expression, his characteristic cleverness. Between 1589-1599, Abbas defeated the Uzbeks and Mughals, and by 1623 had succeeded in driving the Turks back across their former borders, occupying Baghdad in the process. Most importantly, he took the city of Karbala. Now situated in Central Iraq, Karbala represents a site of primary importance to Shi’ite Muslims, as the place where the Imam Hussayn was martyred, c. 680. And so we have, passing through Isfahan or settling there for long periods, a motley band of Europeans—ambassadors and adventurers, monks and mountebanks, traders and travellers, including combinations of each. Some could scarcely read or write, others wrote volumes…. In 1601, Sigismund III of Poland sent an Armenian merchant, Sefer Muratovitch, on a commercial mission to Isfahan with instructions to procure “rugs woven with the royal arms, as well as costly fabrics, tents and weapons, specifically sabre blades of watered steel.” (emphasis added). This Muratovitch did, including a finely chased and gilded silver shield with which Sigismund was ultimately interred. Thus, through trade, the shamshir found its way into the West. The number of sabres and scimitars bearing [the] name [Assad Allah] is legion, so much so that it is difficult to resist the temptation… to say that of the three hundred swords of which approximately he could have made during his life-time, at least five hundred have found their way to Western collections alone. 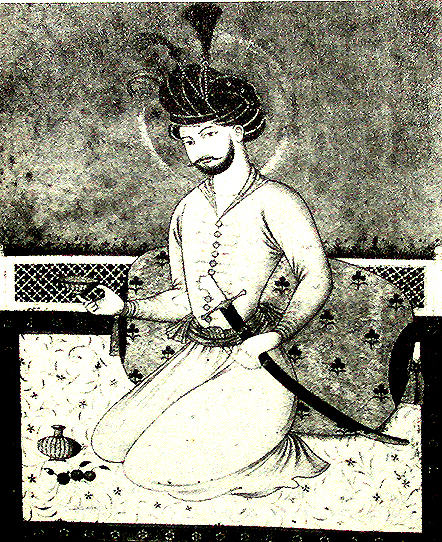 Shah Abbas is said to have received a helmet from the Ottoman sultan, who offered a sum of money to whoever could break the helmet with a sword. No one was able to do this until a certain Asad, a sword-maker, made a sword with which he cut through the helmet. The reward conferred upon the smith named Assad by Shah Abbas, and its far-reaching effects, will be considered below. The literal meaning of the Arabic name Assad Allah is Lion of God. It was not an uncommon given name during the time of Abbas and is still popular in Iran today. More importantly, however, it was one of the sobriquets by which ‘Ali, a figure of virtually unparalleled importance among Shi’ites, was popularly known in Persia. 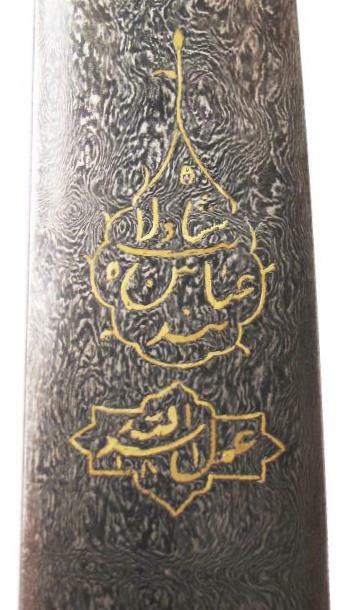 Though no connection between Assad Allah and the Imam ‘Ali via the cognomen Lion of God appears in the literature, the relationship becomes clear iconographically with the increase in sword production of the late eighteenth and early nineteenth centuries. Given the high occurrence of inscriptions on Islamic weapons, it is clear that considerable importance was attached to them. The nature of these inscriptions, and the general quality of workmanship lavished upon them, suggest that these words and signs were intended for both public and private consumption. Irene Bierman has shown that the raiment of Fatimid rulers and their retainers contained referential verses designed to inform and dazzle a public audience. There is no reason to doubt that fine weapons played a similar role, given their almost habitual appearance as sartorial accoutrements in Persian, Ottoman and Mughal miniatures. Inscriptions occur on most forms of edged weapons within the Dar al-Islam, though primarily on swords and daggers. Texts range from Qur’anic quotations and exhortations, through various forms of poetry, to purely referential data, including the names of a maker or owner and the date of manufacture or acquisition. Examples display information recorded in Arabic, Persian, Ottoman, Urdu, Russian and Serbian languages and characters, among others in their respective regions. More rarely, inscriptions in both Arabic and local scripts occur. Both Shi’ite and Sunnite examples often bear phrases glorifying the Fourth Caliph, ‘Ali ibn al-Talib, and in the Ottoman Empire as well as in Persia, poetic couplets in Persian were especially popular. A particular group of Eastern European blades, including Austrian, Hungarian, Polish and Russian, bear marks with clear iconic referents to Arabic, including “arabesque” designs, series of pseudo-Arabic characters and numerals enclosed in cartouches. These are clearly imitative of the Arabic numerals often found inscribed on Islamic blades, corresponding to a specific Sura or incised within a Baduh or talismanic square. Inscriptions found on blades made during the early period tend to be short, referential, and simply-incised, while medieval and later examples often bear lengthy Qur’anic quotations inlaid in gold or silver. Very rarely, swords may include dynastic genealogies, which are helpful in placing forms and types within a chronological framework. The enormous demand for Persian blades both in Persia and abroad resulted in great increases in production at such centers as Khorassan, Qazvin and Isfahan in the late eighteenth and nineteenth centuries. During this period, the elegant form of the shamshir is very rarely found. Persian smiths reverted to producing an appreciably heavier and more complex type of blade, replete with fullers, grooves and false edge, which had been popular prior to the reign of Abbas. 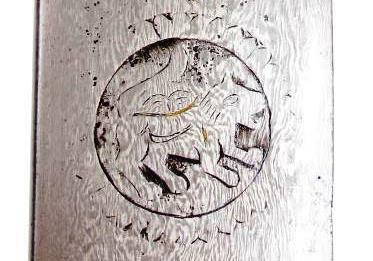 Too, the familiar signature, ‘Amali Assad Allah, began to evolve into a simple pictogram, representing a stylized lion contained within a circular cartouche. 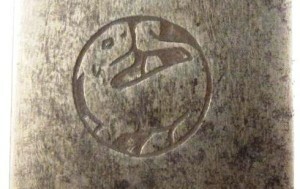 Several examples have come to light which may be considered intermediate in form, these include the Arabic term ‘amali or the name Assad engraved within the body of the lion as well, confirming its symbolism. The transition from written word to pictogram indicates a distinct marketing shift in late-eighteenth century Persia, which coincides with the Qajar rise to power. From what had begun as a limited output of blades, made to order for a small, aristocratic patronage, makers now expanded production to supply a much different segment of Persian society, one which was far more numerous, and correspondingly less literate. We may conclude, from the generally lower quality of these blades, in which forging, finishing and embellishment all suffer by comparison with earlier examples, that the art of the individual swordsmith in Persia had given way to commercialism. Persian damask blades were still greatly prized among bedouin Arabs a century later. Elgood mentions the unification of the ‘Aniza tribes under the Amir of Rwala in N. Arabia during the late 19th and early 20th centuries, who traded at Damascus and Baghdad. The Czech scholar Alois Musil traveled with them and astutely recorded the prices of various types of sword blades offered in the bazaars, “daban [plain? ]… $4.50-$9; … ‘agami [Eastern Iraq], of gray steel… $4.50- $36; the gawhar [johar, Persian wootz] made of cast steel from Horasan, [Khorassan], $135…” The observations of Ouseley and Musil serve to illustrate two important points: first, that the bedouins continued to show a strong preference for Persian blades, and valued them considerably over those of plain steel, and that the inevitable goal of mass production begun by Persian smiths a century before had been reached: greater sales through an appreciable decrease in the price per unit. Shah ‘Abbas was delighted and remitted the tax of the sword-makers. In memory of this event the sword-makers assembled once a year at the grave of Asad, the shamshirsaz, at Sichan near Isfahan. This practice was still current in 1937. The swordsmiths of Isfahan were exempted from income tax for over 300 years. This brings two possibilities to light: first, that the appearance of Assad Allah’s name on blades served to commemorate his considerable contribution to the guild. Secondly, that the government or guild itself required that his name be indited upon each blade for purposes of tax record-keeping. Therefore, the origins of a practice which began, either as an act of commemoration or an accounting measure, passed into history, and the inclusion of the famous signature ultimately became a matter of tradition. The remarkable popularity of Assad Allah blades during the Qajar era, throughout Persia, the Near East and Central Asia, then, was the result of careful exploitation of an established name. Despite the reduced quality of the product, clever marketing in a form which was readily recognizable (i.e. through the use of the lion pictogram), proved exceptionally effective, particularly among the illiterate. The quality of Assad Allah blades produced during the Qajar era also reflects the gradual supplanting of edged weapons by repeating firearms, and the dissipation of the quasi-mystical reverence in which swords had formerly been held. In regions where the sword remained an important spiritual device and primary weapon, as among the bedouin Arabs discussed above, the demand for Persian blades remained consistently high. Seen in this light, the appearance of a finely damasked shamshir blade dated 1921 becomes a legacy, rather than an anomaly. Robert Elgood, The Arms and Armour of Arabia (London, Scolar, 1994), 29. 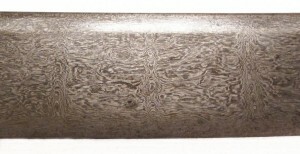 The terms damascus or watered steel are used here in describing a crucible steel which contains between 1.2-1.8% carbon, from which the blades under discussion were forged. It is Indian or Persian in origin; the process by which it was produced was known in India by 200 bce, [ J.C. Bhardwaj, Aspects of Ancient Indian Technology, (Delhi: Motilal Banarsidass, 1979), cited in L. Figiel, On Damascus Steel, (Miami: Atlantis, 1991), 22]. However, the term damascus is a Western one, after the trade center in which Europeans first encountered weapons made of this material. 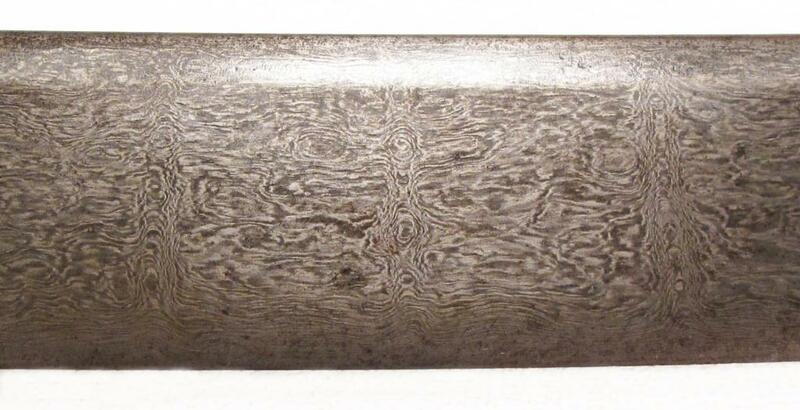 Damascus steel and watered steel are now generally applied to any patterned steel. L. Mayer, Islamic Armourers and Their Works (Geneva: Kundig, 1962), 26. H.S.K. Sabzawari, Futuwat Namah-yi Sultani, (Chicago, Kazi, 2000), Jay R. Crook, trans., 341 and passim. Robert Elgood, The Arms and Armour of Arabia (London, Scolar, 1994), 31. Elgood cites Thomas (1930) and Thesiger (1959), both of whom reported on the Qara bedouins of S. Arabia, among whom swords played an important (though not primary) role during the circumcision ritual. A. R. Zaky, Medieval Arab Arms, in R. Elgood, Islamic Arms and Armour (London: Scolar, 1979), 203. Ibid. Samsama’s lineage was traced to the region of ‘Ad in Southern Arabia. It was acquired by the Ummayad caliphs and the Abbasids after them. It is no longer mentioned in chronicles of the ninth century. J. Hathaway, The Forgotten Icon: The Sword Zulfikar in Its Ottoman Incarnation, unpublished, 5. Cited with the kind permission of the author. Z. Zygulski, Islamic Arms in Polish Collections, Ibid, 215. S.C. Welch, Imperial Mughal Painting, (N.Y.: George Braziller, 1978). Work of Abu’l Hasan, 1618-1622, Freer Gallery of Art, Smithsonian Institution. G. F. Laking, Oriental Arms and Armour, (London: Clowes, 1964) 6-9. There are several very fine swords which qualify as Persian shamshirs in the Wallace Collection, London. Labeled ‘Abbasi,’ these were collected in situ by the collections’ founders beginning in the latter 18th century. Conveniently, the regions of origin of many of the items, as well as their local names, were recorded when they were acquired, and it is clear that the term Abbasi is a nisba of Abbas . However, in N. India ‘Abbasi seems to have been applied to several forms of sword in addition to the shamshir. It is therefor likely to have referred to weapons of high quality rather than a particular form. Cz. Jarnuszkiewicz, Szabla Wschodnia I Jej Typu Narodowe (London: Anykwariat, 1973), 117-18, PL. 21, 22. Earlier Persian paintings uniformly represent a distinctly Turkic form of sabre, the kilic. To my knowledge, no clear representation of the shamshir occurs in paintings prior to the portraits of Abbas noted above. His son and successor, Shah Safi, is shown wearing what is probably the same sword, in a painting in the Hermitage Collection , St. Petersburg, dated 1633, as is his grandson, Abbas II (r. 1642-67) in an unreferenced portrait pictured in G. Gurney, Kingdoms of Asia, the Middle East and Africa (New York: Crown, 1986), 162. J. Ostrowski and W. Bochnak, Polish Sabres: Their Origins and Evolution, in Art, Arms and Armour (Chiasso: Acquafresca, 1979), 233. The popularity of the karabela hilt in Poland was such that military scholars have often ascribed it a Polish provenance in the absence of evidence to the contrary. Likewise, the term has been applied indiscriminately to many different types of sabre there, though its etymology, other than a long-outdated (and coincidental) association with the Italian words, cara bella (dear beauty), remains both “unexplained, [and] groundless….” (Ostrowski and Bochnak , 233) Ostrowski and Bochnak concede that the “earliest known examples in Poland” were acquired after the Siege of Vienna in 1683 (Ostrowski and Bochnak, 233), though many sources continue to represent the karabela as an exclusively Polish weapon. Elgood’s Arms and Armour of Arabia is a notable exception. Robert Elgood, The Arms and Armour of Arabia, 15. Sir R. Stevens, European Visitors to the Safavid Court, in The Journal of Iranian Studies, (Harvard, 1974) Volume VII, 3-4, 421. J.W. Allan, Persian Metal Technology, (London: Ithaca, 1979), 66. L. Figiel, On Damascus Steel, (Miami: Atlantis, 1991), 24. The author notes the wax resist process, which was popular in both Europe and the Near East. The term Kirk Narduban appears to be another case of mistransliteration from the Turkish Kirk (forty) Merdeven (steps or stairs). George C. Stone, A Glossary of the Construction, Decoration, and Use of Arms and Armor (N.Y.: Jack Brussel, 1961), 77. L. Mayer, Islamic Armourers and Their Works, 26. George C. Stone, A Glossary of the Construction, Decoration, and Use of Arms and Armor, 77. Stone’s effort was a monumental one. Compiled between the 1890s and the 1930s, it still represents the standard reference for Islamic and Indian weapons. A.K.S. Lambton, Islamic Society in Persia, orig. pub. 1954 (London: Variorum,1980), 25. P. Tamavoli, Lion Rugs: The Lion in Art and Culture of Iran (N.Y.: TransBook, 1985), 2. I. Bierman, Writing Signs: The Fatimid Public Text, (L.A.: UC, 1998), 122. S. Blair & J. Bloom, The Arts and Architecture of Islam 1250-1800 (New Haven: Yale, 1994), 28, 60, 210, passim. A. Astvatsaturian, Orujiye Narodov Kavkaza (Moscow: Khobbikniga, 1995), 105, passim. E. Wagner, Cut and Thrust Weapons (London: Spring, 1967), 73. A series of quasi-Arab numerals are shown which the author interprets primarily as astrological signs. L.A. Mayer, Islamic Armourers and Their Works. (Geneva: Albert Kundig, 1962), 6. The baduh is a talismanic square which is ruled off in a grid pattern. Each box in the grid contains an Arabic numeral or character which bears a numerological value. It is found on Berber jewelry as well as swords and daggers from the Arab Peninsula and Mughal India. There appears to be no distinction in its use between Shi’ites and Sunnites. Z. Zygulski, Islamic Arms in Polish Collections, 206. An Arab sword of typical symmetrical form in the Topkapi collection is inscribed with the name of ‘Umar ibn Al-Aziz, an Umayyad caliph (d. 720) and the date 100 a.h./719 a.d.
 A. North, Swords of Islam, 140-41, in M. Coe ed., Swords and Hilt Weapons (London: Prion, 1996). 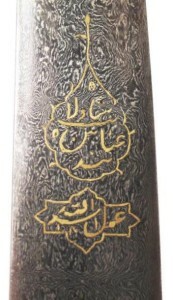 A sabre belonging to Shah Tahmasp, Abbas’ grandfather, in the Victoria & Albert Museum, London, is inlaid along the spine with the Safavid geneology. This is a heavy sabre of complex section which was replaced by the shamshir in Abbas’ time. A. North, An Introduction to islamic Arms and Armour (London: HMSO, 1985), 32. L. Mayer, Islamic Armourers and Their Works (Geneva: Kundig, 1962), 27. Mayer further lists 60 blades publicly and privately held, which are datable by ruler, 45 published and 43 unpublished blades, which bear only the name Assad Allah, with neither date nor ruler’s name. Of forty-six shamshir blades I catalogued in private American collections, only fifteen were signed, eight with the name Assad Allah, of which six included the name of Shah Abbas. Only one was actually dated (1604). Robert Elgood, The Arms and Armour of Arabia, 29. This type of blade represents the revival of a medieval form of sword called the Kalachuri. Introduced by various Central Asian nomadic groups between c. 900c.e. and 1100 c.e., the Kalachuri was rapidly adopted throughout the Near East and Western Asia. Beyond stylistic neoclassicism, Persian blades produced in the nineteenth century of Kalchuri-form likely had a distinct ethnic significance for Persia’s Turkic enclaves, including Azaris and Turkmen, as well as for the Qajars themselves, who, like the Safavids, were of Turkic origin. The shamshir apparently retained popularity among the Persian nobility, it is the only type of sword with which they are represented in period paintings. Most 19th century Persian shamshirs bear 17th and 18th century blades, given their form. The shamshir did remain in production in the Ottoman Empire, N. India and among the bedouin Arabs until after the turn of the century. P. Tanavoli, Lion Rugs: The Lion in Art and Culture of Iran, 3. The Shir-e Khorshid, or Lion and Sun, became the Qajar dynastic crest, in emulation of European models, and remained the Persian state emblem until recently. The lion was also an important icon in pre-Islamic Persia. Sir W. Ouseley, Travels in Various Countries of the East; More Particularly Persia, (London, Rodwell & Martin, 1821), 211. In 1811, the British Pound was still equivalent to a Sovereign, or .2354 troy ounces of fine gold. At a rate of ~ $1,100 per ounce at the present time (based upon an average of prices from the years 2004-2014,) the Sovereign would currently be worth about $260. Therefore, if as Sir William Ouseley notes, “a greater price than this [70-80 pounds] is frequently given for a good blade alone, especially if an old Kara Khorasani, or if made in the time of Sha’h Abba’s by Ased Allah of Isfahan,” a good vintage shamshir blade would typically have brought amounts of $18,200.00- $20,800.00 , in contemporary terms. I am indebted to the Alhambra Coin Center, Alhambra, CA., for assistance in establishing the value of the British Pound in 1811. Robert Elgood, The Arms and Armour of Arabia, 29, citing A. Musil, Manners and Customs of the Rwala Bedouins, American Geographical Society, New York, 1928. Musil was a Catholic priest, daring traveler, photographer, an Arabic linguist of note and , by British accounts, an Ottoman agitator during WWI. First, the skill of smithing, or forging, represented a specialty unto itself, and is distinct from chiseling or engraving, which involved different skills and tools, and probably different guilds as well. I have catalogued several swords embellished with engraving and chiseling; individual sections of which were clearly done by different hands, suggesting the probability that, as in other arts, apprentices did the lesser work– some showed considerable variations in skill. 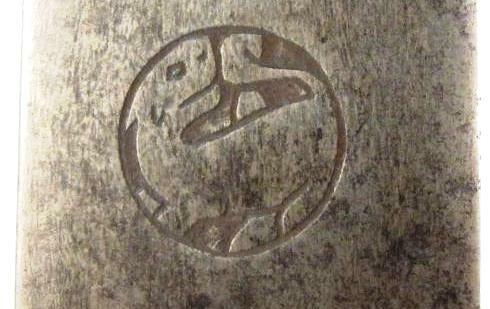 It was further necessary that a signature be chiseled or incised upon a blade before it was heat-treated (which task falls within the realm of the smith once again) otherwise the steel became too hard to work easily. A.K.S. Lambton, Islamic Society in Persia, 26. Robert Elgood, The Arms and Armour of Arabia, 21. Shah Isma’il sent Selim I an elaborately decorated sabre, just as an overlord would do to show approval of a vassal. Robert Elgood, Islamic Arms and Armour (London: Scolar, 1979), 136-147. Allan, J.W. Persian Metal Technology. London: Ithaca, 1979. Art, Arms and Armour. Chiasso: Acquafresca, 1979. Astvatsaturian, A. Orujiye Narodov Kavkaza. Moscow: Khobbikniga, 1995. Bierman, I. Writing Signs: The Fatimid Public Text, L.A.: UC, 1998. Blair, S. & Bloom, J. The Arts and Architecture of Islam 1250-1800 New Haven: Yale,1994. Coe, M., ed. Swords and Hilt Weapons. London: Prion, 1996. Elgood, Robert. The Arms and Armour of Arabia. London: Scolar, 1994. Figiel, L. On Damascus Steel. Miami: Atlantis, 1991. Gurney, G. Kingdoms of Asia, the Middle East and Africa. New York: Crown, 1986. Hathaway, J. The Forgotten Icon: The Sword Zulfikar in Its Ottoman Incarnation, unpublished. Jarnuszkiewicz, Cz. Szabla Wschodnia I Jej Typu Narodowe. London: Antykwariat, 1973. Laking, G.F. Oriental Arms and Armour, London: Clowes, 1964. Lambton, A.K.S. Islamic Society in Persia, London: Variorum,1980. Mayer, L. Islamic Armourers and Their Works. Geneva: Kundig, 1962. North, Anthony. An Introduction to Islamic Arms and Armour. London: HMSO, 1985. Pinchot, Oliver. Arms of the Paladins: The Richard R. Wagner Jr. Collection of Fine Eastern Weapons. Woonsocket: Mowbray. 2014. Sabzawari, H.S.K. Futuwat Namah-yi Sultani. Chicago, Kazi, 2000. Jay R. Crook, trans. Stone, George C. A Glossary of the Construction, Decoration and Use of Arms and Armor. N.Y.: Jack Brussel. 1961. Tanavoli, P. Lion Rugs: The Lion in Art and Culture of Iran. N.Y.: TransBook, 1985. Thubron, C. The Venetians, Alexandria: Time Life, 1980. Wagner, E. Cut and Thrust Weapons. London: Spring, 1967. Welch, S. C. Imperial Mughal Painting, N.Y.: George Braziller, 1978. 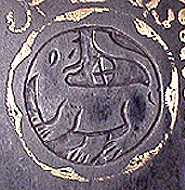 Zygulski, Z. Islamic Arms in Polish Collections. Warsaw: Krajowa Ajency, 1982.